1850 Sq Feet Approx Available for Doctors Office. Listing Agents has to be present at the time of showing the property. Showing by appointment only. 1350 Sq Feet Aprox Available for Doctors Office. Listing Agent has to be present at the time of showing the property. Showing only by appointment. 218 Robeson St- Near Highsmith- Rainey Hospital, cady- corner across from New Multi- Modal Center. Great Space & Location for Law Offices, Insurance, Real Estate, or Medical Office. Modified Gross Lease. Landlord prefers two or three year lease term. Two Private Offices, lobby/ reception/watigin area, larger open area could be used as a large conference room, or used as an open multi-person working area. Space has one dedicated unisex restroom. Excellent site for high-traffic retail, food-service, automotive, etc. Located on HWY 87 in Spring Lake, NC between Sanford and Fayetteville. Major thouroughfare to Spring Lake, Fort Bragg, Sanford and Fayetteville. Site is flat. Owner prefers to sell, but will consider lease. Listing agent has to be present at the time of showing. Utilities are not included. Suite C and C-1 is 3,000 square feet approximately. Remodeled and updated recently. (2) Months of Free Rent. Suite 107 has signage available. Property is located US Hwy 401. Class C office building available for lease. 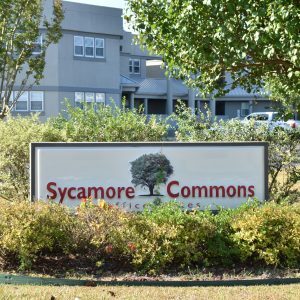 Sycamore Commons are conveniently located on Wagoner Drive, just off Sycamore Dairy Road, between Bragg Blvd. and the Cross Creek Mall trading area.